Sporting accidents are one of the most common causes of dental injury. More than 5 million teeth are knocked out or damaged each and every year, with these injuries resulting in nearly $500 million dollars worth of dental fees. It is estimated that almost 40% of dental injuries are related to sports and each year thousands of people, including children, are treated for dental injuries that could have been avoided or minimised by wearing a protective, mouthguard. Damaged or knocked out teeth, cut lips and even more painful injuries including broken jaws and can be sustained when playing contact sports. Wearing a mouthguard helps to absorb and minimise the impact of a blow to your face, which might otherwise have result in an injury to your mouth or teeth. In fact, athletes are 60 times more likely to suffer damage to their teeth when not wearing a mouth guard! Dental injuries can result in time off school or work to recover, can be painful and disfiguring, and may involve lengthy and complex dental treatment. The cost of an injury to your teeth or jaw far exceeds the cost of a custom-fitted mouthguard. 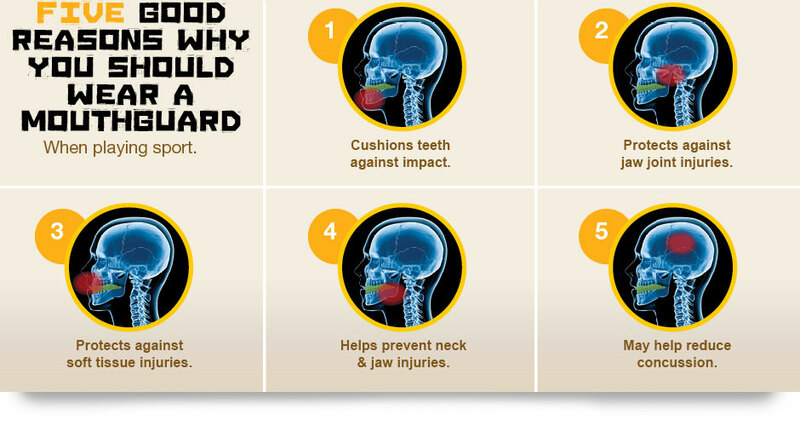 A custom-fitted mouthguard not only protects your teeth but can also prevent or reduce the impact of injuries to other parts of your head and jaw. Sporting accidents are one of the most common causes of dental injury. Every year thousands of people, including children, are treated for dental injuries that could have been avoided or minimised by wearing a protective, custom-fitted mouthguard. Just like having the correct shoes and sporting equipment, all people playing these sports need to wear a custom-fitted mouthguard. How Much Does a Mouth Guard Cost? Mouthguards should be worn whilst playing and training for any sport where there is a possibility of contact to the face. These sports can include football, basketball, hockey, lacrosse as well as combat sports such as MMA. In exactly the same way that you wouldn’t dream of entering the court without the correct basketball shoes, or head on to field with the right football cleats, a mouthguard should be a vital part of your sports kit.